NOTICE: Activation key must be used on a valid Steam account. Requires internet connection. About the gameProject Remedium is a story-driven action shooter set inside a human body devastated by illness and bad circumstances. It's a post-apocalypse of sorts, a really tiny one, but for a nanobot named Nano+, the body is a whole world. So he is hell-bent on fixing it with his guns and a unique g… rapnel. 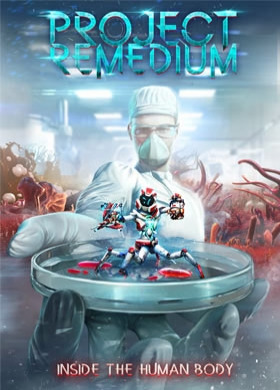 In this first game by Atomic Jelly, a nanobot journeys through a human organism to revert the effects of strange illness and a set of unfortunate events that occurred.Armed with once purely medical equipment that now became a duo of adaptive weapons - the Energy Cannon and the Remedium Sprayer - and able to travel in a fast and agile way with help of an invaluable grapnel, Nano+ can fight pathogens, mutated organisms and deranged nanobots, heal, help his allies and interact with a unique environment.Nano+ is not alone in hist struggles: the veteran nanobot SuperVisette will guide him through the journey and the last sane nanobots struggling to maintain health and order will also help however they can. Key Features upgradeable weapons for damage dealing and accelerated healing versatile grapnel for climbing and quick getaways substance crafting for improving both treatment methods and feats of Nano+ interactive environment with infected tissue and ailments a story to discover and friendly nanobots to provide aid various missions related with healing and helping fellow bots bloodstream and 6 organs to heal	System Requirements Windows - Minimum OS: Windows 7 / 8 / 10 Processor: Intel Core i5-4690 / AMD Ryzen 5 1500X Memory: 4 GB RAM Graphics: NVIDIA GeForce GTX 760 or AMD Radeon R9 270X with 2GB VRAM or more DirectX: Version 11 Storage: 10 GB available space Sound Card: DirectX compatible Additional Notes: Mobile GPUs are not officially supported, the game may work but we cannot guarantee it. Windows - Recommended OS: Windows 7 / 8 / 10 Processor: Intel Core i5-6600K / AMD Ryzen 7 1700X Memory: 8 GB RAM Graphics: NVIDIA GeForce GTX 1060 or AMD Radeon RX 580 Series with 2GB VRAM or more DirectX: Version 11 Storage: 10 GB available space Sound Card: DirectX compatible Additional Notes: Mobile GPUs are not officially supported, the game may work but we cannot guarantee it.